Gérard Xavier Marcel Depardieu (French: [ʒeʁaʁ dəpaʁdjø]; born 27 December 1948) is a French actor, filmmaker, businessman and vineyard owner. He is one of the most prolific actors in film history, having completed approximately 170 movies since 1967. He received critical acclaim for his performances in The Last Metro (1980), for which he won the César Award for Best Actor, in Police (1985), for which he won the Venice Film Festival Award for Best Actor, Jean de Florette (1986) and Cyrano de Bergerac (1990), winning the Cannes Film Festival for Best Actor, his second César Award for Best Actor and his first Academy Award nomination for Best Actor. He co-starred in Peter Weir's comedy Green Card (1990), winning a Golden Globe Award and later acted in many big budget Hollywood movies including Ridley Scott's 1492: Conquest of Paradise (1992), Kenneth Branagh's Hamlet (1996), Randall Wallace's The Man in the Iron Mask, and Ang Lee's Life of Pi (2012). He is a Chevalier of the Légion d'honneur and Chevalier of the Ordre national du Mérite. He was granted citizenship of Russia in January 2013, and became a cultural ambassador of Montenegro the same month. Gérard Depardieu was born in Châteauroux, Indre, France. He is one of the five children of Anne Jeanne Josèphe (née Marillier) and René Maxime Lionel Depardieu, a metal worker and volunteer fireman. Leaving school at the age of 13 he took a job at a printworks, but also began to get involved in petty crime, resulting in his being put on probation at one point. At the age of 16, Depardieu left Châteauroux for Paris. There, he began acting in the new comedy theatre Café de la Gare, along with Patrick Dewaere, Romain Bouteille, Sotha, Coluche, and Miou-Miou. He studied dancing under Jean-Laurent Cochet. His breakout film role came in 1974 playing Jean-Claude in Bertrand Blier's comedy Les Valseuses (Going Places). Other prominent early roles include a starring role alongside Robert De Niro in Bernardo Bertolucci's historical epic 1900 (1976) and a role in François Truffaut's The Last Metro (1980), for which he won his first César Award for Best Actor. His international profile rose as a result of his performance as a doomed, hunchbacked farmer in the film Jean de Florette (1986) and received critical acclaim for his starring role in Cyrano de Bergerac (1990), for which he won his second César Award for Best Actor, the Cannes Film Festival for Best Actor and received a nomination for an Academy Award. 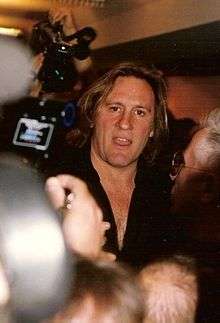 Depardieu co-starred in Peter Weir's English language romantic comedy Green Card (1990), for which he won a Golden Globe Award. He has since had other roles in other English language films, including Ridley Scott's 1492: Conquest of Paradise (1992), Kenneth Branagh's Hamlet (1996), and Ang Lee's Life of Pi (2012). More recently, he has played Obélix in the four live-action Astérix movies in which he is said to have discovered Mélanie Laurent when she was 14. In 2009, he took part in a rare performance of Sardou's La Haine at the Festival de Radio France et Montpellier Languedoc Roussillon, with Fanny Ardant; subsequently broadcast on France Musique. In 2013, he starred in an independent film entitled A Farewell to Fools. Depardieu features as a main character in Antwerp (Edinburgh Festival 2014), a play in The Europeans Trilogy (Bruges, Antwerp, Tervuren) by Paris-based UK playwright Nick Awde. In 1970, Depardieu married Élisabeth Guignot, with whom he had two children, actor Guillaume (1971–2008) and actress Julie (1973). On 28 January 1992, while separated from Élisabeth, he had a daughter, Roxanne, with the model Karine Silla. In 1996 he divorced Élisabeth and began a relationship with actress Carole Bouquet, who was his partner from 1997 to 2005. 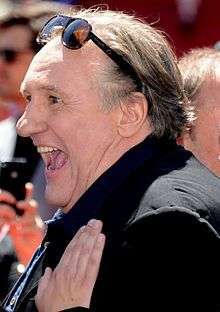 Depardieu at the 2015 Cannes Film Festival. On 14 July 2006, he had a son, Jean, with French-Cambodian Hélène Bizot (daughter of François Bizot and not to be confused with actress Hélène Bizot). Since 2005, Depardieu has lived with novelist Clémentine Igou. On 13 October 2008, his son Guillaume, whose health had been severely affected by drugs, a motorbike crash and a hospital infection contracted during the post-accident operations, eventually leading to the amputation of his leg, died at the age of 37 from complications linked to a sudden case of pneumonia. In recent years, Depardieu has attracted attention from the media and legal authorities for his behavior. On August 16. 2011, he urinated in a bottle, which overflowed onto the carpet of a CityJet airplane as it departed Paris for Dublin. In August 2012, he was accused of assault and battery for punching a motorist in Paris. In November 2012, he was arrested for driving while intoxicated after he fell from his scooter, and was found to have a blood alcohol level of 1.8 grams per litre, well above the French limit for driving of 0.5. He has been an official resident of Néchin, Belgium since 7 December 2012. French prime minister Jean-Marc Ayrault criticised his move. On 15 December 2012, Depardieu publicly stated he was handing back his French passport. On 3 January 2013, Russian President Vladimir Putin signed an Executive Order granting Russian citizenship to Depardieu. In his first interview thereafter, Depardieu attacked Putin's critics. In his autobiography Depardieu said Putin 'immediately liked my hooligan side.' In February 2013 he registered as a resident of Saransk. Also in January 2013 he was appointed a cultural ambassador for Montenegro. During the summer of 2015, due to Russian-Ukrainian political issues, Depardieu was banned from TV and movie theaters in Ukraine. Depardieu with Vladimir Putin in Sochi, Russia, January 5, 2013. ↑ "Gerard Depardieu Biography (1948–)". Filmreference.com. Retrieved 26 February 2010. ↑ "Les ancêtres de Gérard Depardieu (1948)" (PDF). Archived from the original (PDF) on 30 October 2008. ↑ Atkin, Tim (4 September 2005). "Voulez-vous poulet avec moi?". The Observer. Guardian News and Media. Retrieved 27 April 2014. ↑ Lichfield, John (10 February 2003). "This Europe: Confessions of Depardieu". The Independent. UK. Archived from the original on 17 January 2009. Retrieved 26 February 2010. ↑ Presentation of concert on Festival de Radio France site. ↑ "Monterey Media Acquires Three Films, Including Works Starring Gerard Depardieu and Harvey Keitel". indiewire.com. 17 October 2013. Retrieved 6 November 2013. ↑ "Bouquet — Depardieu en crise". Dhnet.be. 31 August 2005. Retrieved 26 February 2010. ↑ Sloan, Michael (22 April 2011). "Upheaval of life blamed on Apsara". The Phnom Penh Post. Cambodia. Retrieved 25 April 2011. ↑ Lichfield, John (14 October 2008). "Gérard Depardieu's son dies of pneumonia at 37". The Independent. Retrieved 3 January 2013. ↑ Henry Samuel (17 August 2011). "Gerard Depardieu 'sorry' to have urinated on plane carpet". The Telegraph. ↑ Henry Barnes (17 August 2012). "Gérard Depardieu accused of punching motorist in road rage assault". guardian.co.uk. ↑ Kimberley Dadds (29 November 2012). "French actor Gerard Depardieu 'arrested for driving scooter drunk' in Paris following minor accident". DailyMail. ↑ Fraser, Christian (17 December 2012). "Depardieu: French film star stirs tax row". Bbc.co.uk. Retrieved 25 January 2013. ↑ "Depardieu tax exile move 'shabby' - French PM Ayrault". BBC. 12 December 2012. Retrieved 17 December 2012. 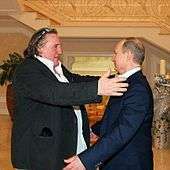 ↑ "Depardieu 'to give up passport' in tax exile row". BBC news. 16 December 2012. ↑ "Gérard Depardieu : "Je rends mon passeport"". lejdd.fr. 15 December 2012. ↑ "Executive Order on granting Russian citizenship to Gerard Depardieu". Russian Presidential Executive Office. January 3, 2013. ↑ "Depardieu attacks Russia's opposition.". Aljazeera.com. Retrieved 25 January 2013. ↑ "Depardieu nommé ambassadeur de la culture du Monténégro". La Voix de la Russie. 9 January 2013. Retrieved 27 April 2014. ↑ "ORDRE DE LA LÉGION D'HONNEUR Décret du 30 décembre 1995 portant promotion et". JORF. 1996 (1): 8. 2 January 1996. PREX9513805D. Retrieved 22 March 2009. Collins, Lauren (February 25, 2013). "L'étranger". Annals of Celebrity. The New Yorker. 89 (2): 58–65. Retrieved 2015-05-02. Russian artist Shishkin writes portrait of Gerard Depardieu//Channel One.